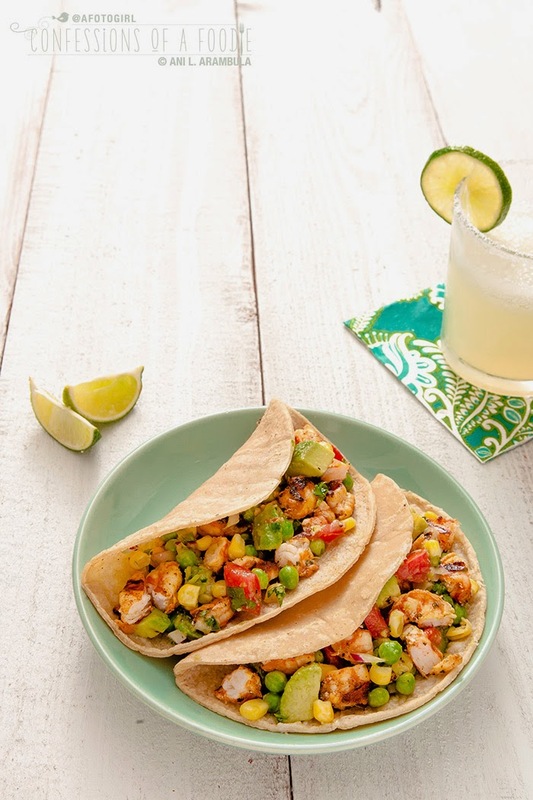 Grilled shrimp tacos with an avocado salsa is a healthy, quick meal easy enough for mid-week dinners and special enough for weekend entertaining. Summer may be over in most parts of the country but Southern California’s annual sun storm is just getting started. We’re dealing with triple digit numbers here and to make it worse, we are in the midst of one of the most severe droughts in recent California history. Wouldn’t it be nice if we could skip the heatwave for the next two months and head straight into the slightly cooler breezes of November? One can dream, right? If you’re like me, this heat is keeping you out of the kitchen and has you opting for more grilling (or crockpot) recipes. I think this recipe today is one you are going to love. It’s easy and dinner is on the table quickly! 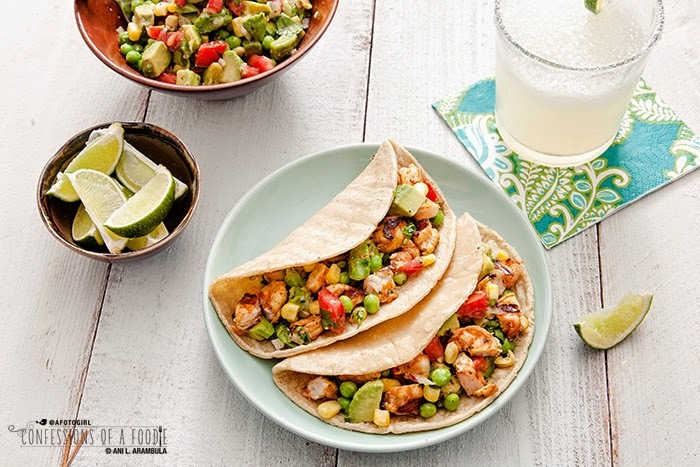 The marinade for this recipe is a simplified version of the marinade for my Tequila-Lime Shrimp and instead of serving the shrimp whole on skewers, we’re giving them a quick chop and serving them up in fresh corn tortillas. Shrimp has a fairly neutral flavor so it’s the perfect canvas to highlight different spices from around the world. The tequila and lime in this preparation always makes me feel like I’m chillaxin' in Baja, enjoying sweet ocean breezes, sipping margaritas and taking in the local color. These babies are super easy to prepare and cook quickly on the grill so you don’t have to bear the heat too long. Plus, you can take advantage of the last month of California’s avocado season with my simple and refreshing Avocado Salsa Cruda. This salsa is so versatile. I love it on steaks, on chicken, even on cauliflower or portobello “steaks”! This recipe is also a good one for casual, low-fuss weekend gatherings. Along with Avocado Salsa Cruda, serve the tacos buffet style with an assortment of optional toppings like hot sauce, Mexican sour cream, sliced jalapeños or shredded red cabbage as to encourage your guests to personalize their tacos. 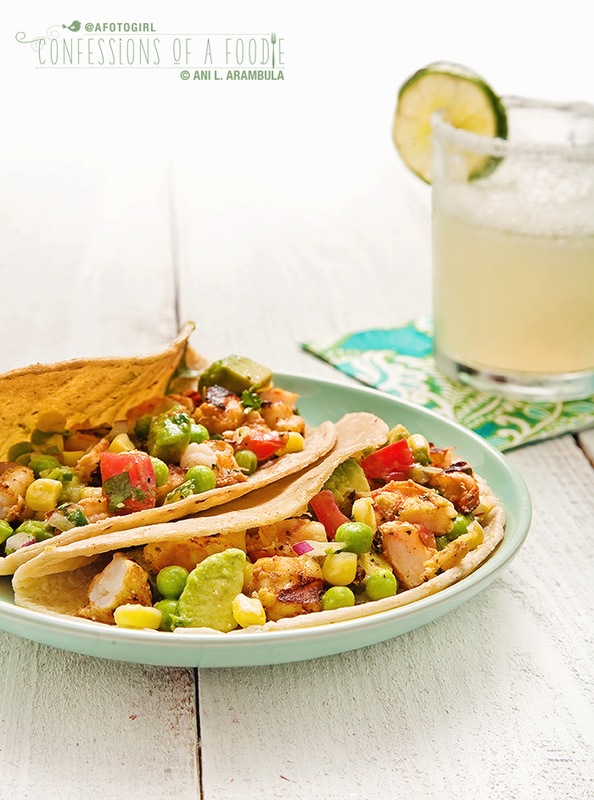 Accentuate the lime-goodness by pairing them with frozen margaritas. It’s casual entertaining, California style! If you live near a Mexican grocer with an in-house tortilleria, it’s definitely worth it to buy your corn tortillas there. There is a huge difference in quality, taste and texture between freshly made authentic corn tortillas and the mass produced and packaged commercial variety available at large supermarkets. A Mexican market will also carry the chile powder and fresh chiles, however, most supermarkets (Ralph’s, Vons, for example) carry California chile powder and Mexican oregano near the Mexican food aisle. Pasilla peppers are often mislabeled as poblanos so use whichever is available at your grocers. 1. Place shrimp in a large ziplock bag. Set aside. 2. For the shrimp: Add the tequila, lime juice and zest, oil, cilantro, chile and cumin to a small bowl. 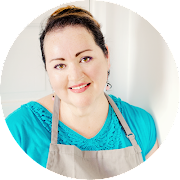 Place the oregano in the palm of your hand and rub your hands together over the bowl to crush leaves and flower buds (this releases the essential oils from the oregano). Use a whisk to combine well. Add to shrimp. Refrigerate for 30 minutes. 3. For the salsa: Toss all the ingredients for the salsa in a bowl being careful not to mash the avocado. Cover and refrigerate until ready to serve tacos. 4. Lightly oil your grill grates. Heat the grill to hot (450˚F). 5. Curling up the shrimp so it makes the shape of the letter “c”, carefully thread the skewer close to the head and through the shrimp. Take a second skewer and thread it through the tail end. Continue until you have four shrimp on each pair of skewers. 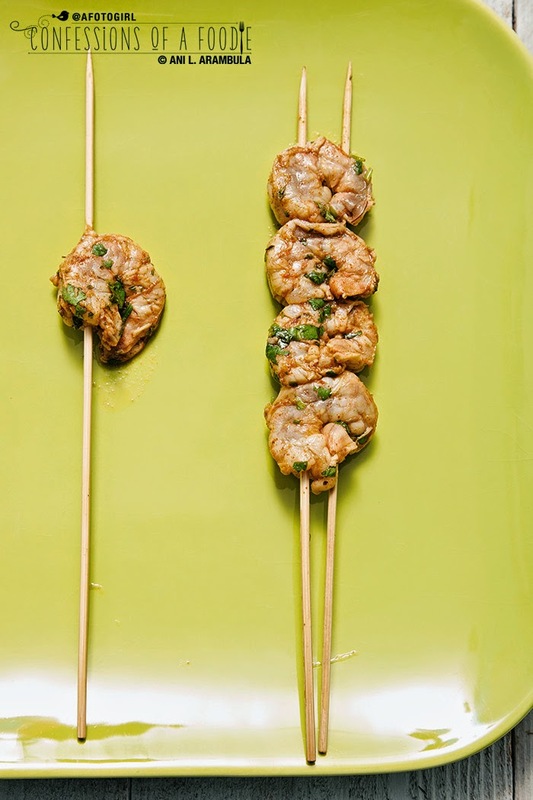 Threading the shrimp onto two skewers prevents the shrimp from spinning on you when you flip the skewers. 6. Place skewered shrimp on grill and cook for 3 to 4 minutes with lid open. Carefully flip shrimp using tongs. Cook for 3 to 4 minutes on the flip side or until shrimp is bright pink and opaque. Remove and let cool for a few minutes before removing from skewers. 7. When cooled enough to handle, chop shrimp into bite sized pieces, place in a bowl and serve in a fresh corn tortilla with a spoonful of the salsa. Recipe can easily be doubled. Until next time friends! Take care and if you’re in SoCal, keep hydrated, stay cool and be safe. Fire season is here.